Well, it's time for another Tablescape Thursday with our hostess, Susan at Between Naps on the Porch! 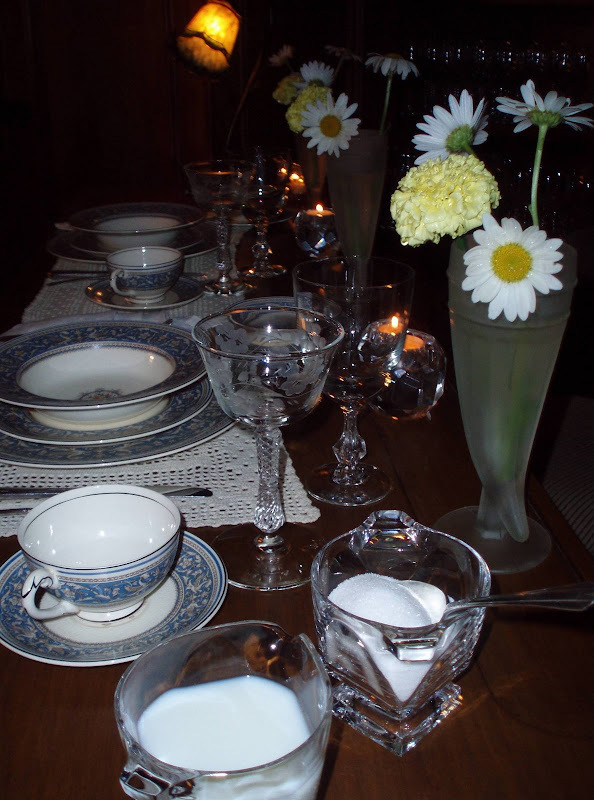 Please visit her beautiful blog to see her wonderful tablescapes! Make sure to visit all the other participants. I also thought I'd try linking to "Thrifty Thursday" over at Tales from Bloggeritaville hosted by Leigh. Go on over and check out her showcase for thrifty finds! Fifi of Fifi Flowers Design Decor paid me a fantastic compliment today! She based one of her wonderful paintings on a tablescape I posted a couple of weeks ago. Please check it out here and let Fifi know you've seen it! Thank you, Fifi, and thanks to all of you who have been so kind and supportive. It had rained here all night, so it was too wet to set a table for you outside. I've already "done" the dining room and breakfast nook ... so I decided to set a table that's not a table. It was light outside ... around 7am, but a few candles always enhance the mood. These are some of my favorite dishes, "Medici" by Myott/Staffordshire. They're very similar to a pattern by another English company, "Florentine" by Wedgwood. 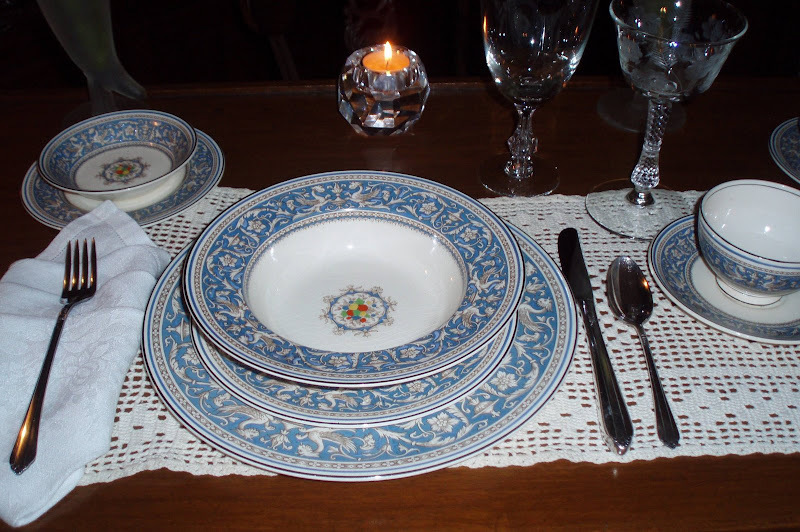 Wedgewood introduced "Florentine" in 1931, and it's still an active pattern. The primary difference is that the raised enameling in the center of "Florentine" depicts flowers, rather than fruit ... and it retails for $400 for a 5-piece place setting! I found 40 pieces of "Medici" at a local antique mall for $100 (after a bit of negotiating). A fire destroyed Myott's records and pattern books, so not much is known about dates, etc. of many of their patterns. These dishes are definitely old, and there's some "crazing" (the slight crackle you can see in the glaze if you look closely), but I don't mind that they've been used and obviously loved. For me, it adds to the interest and reminds us that the pieces have a history. The silverplated flatware is by Rogers. The pattern is: Starlight / Hostess / Claridge. I have no idea why it's listed under so many names, but I like the simplicity and the art deco influence. You'll notice that the handles are longer-than-average on the forks and knives. That was popular during the 1930's and 40's. It's called the "viande" or "grille" style. It reflects deco styling; the idea was that it would be an ergonomic design well-suited to cutting and eating steak, etc. (viande is French for meat). It seems that grilling became popular during that era. I think it was primarily seen as being something new and stylish ... a marketing concept. I happen to like the proportions ... that's probably why long-handled iced tea spoons and seafood forks appeal to me visually. The "placemat for two" is a hand-crocheted runner from an estate sale. It cost $1. You can see some of the glassware I've been collecting in the background. I had planned to use these vases for roses, but the rose garden took a beating during all the heavy rain. I looked around, and the marigolds were standing proudly. Somehow though, it seemed that single marigolds looked lonely in the containers. The daisies had also survived the rain intact, so I snipped a few of those. Actually, some of the ones pictured here were used in last week's tablescapes ... they're definitely durable flowers! The "vases" are vintage frosted hunting horn-shaped pilsner glasses by Tiara. They were a Goodwill find at $.99 each. A well-known replacement service lists them for $13.99 each. I decided to use tall sherbet/champagne glasses for juice. This is a Rock Sharpe pattern. I really like the sparkly stems. The water glass is from the mid 1950's. It's "Tempo" by Heisey. They're very nice quality (comparable to Fostoria). I found them at an estate sale (covered with dust on an outside table) priced at 3 for $2.50. It was the second day of the sale, so I offered $1 for the set ... offer accepted! I have a fairly large set of the same stem with an etched pattern -- that's how I knew they were Heisey when I spotted them at the sale. A close up of the etch/cutting on the Rock Sharpe stems. They're probably from the late 1930's. I paid $12 for ten at a local antique mall (after chatting with the dealer who was in her booth that day). They had been priced at $22, which was already a great price. Since I know she likes to negotiate, I figured it wouldn't hurt to offer less. Prices often depends on how much the dealers have invested in the pieces, whether the rent is due, if they're overstocked, etc. It definitely pays to be polite, and it's never a good idea to offer an insultingly low amount. 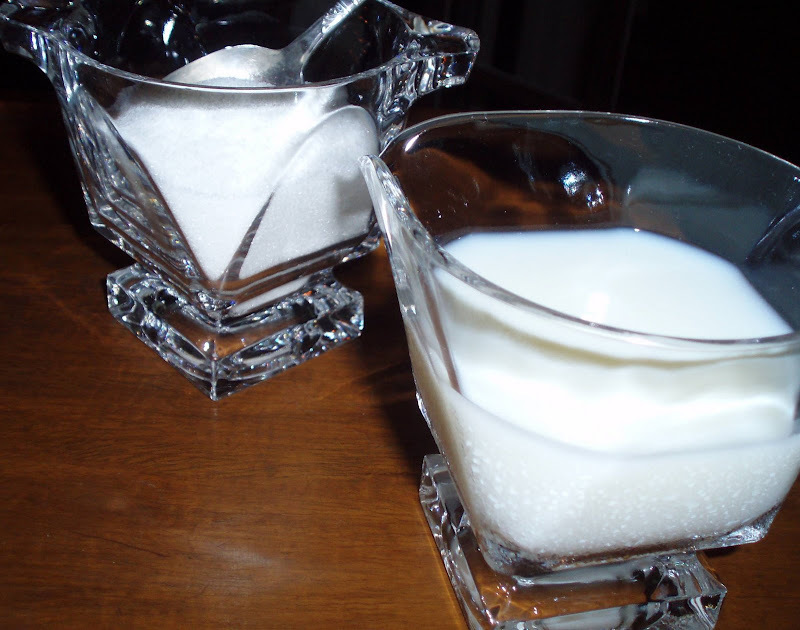 I think the simple lines of the sugar bowl and creamer have a deco influence. The're a 1970's pattern by Fostoria called "Transition." One of the pieces still had the original Fostoria label ... I removed it today just for you! I bought the set at a salvage store in Illinois for $4. And there you have it ... breakfast on the bar! Well ... minus the food ... what would you like me to serve? Well, Bill... you have done it again!! Another lovely tablescape. I love the china you chose for this... it's very similar to a pattern my aunt had. I really love what looks like a horn cup that's executed in crystal or glass and is holding your flowers. How neat! You just do the best job! that is absolutely wonderful. I love the crystal, so beautiful. Oh my - I think a PB&J would taste like heaven on these dishes! I love art deco and the long legged silverware! All so lovely. I'm missing posting this week - but I still had to peek at what everyone else was scaping! Love this. Oh my goodness...this is just absolutely beautiful, Bill. I love the dishes..so pretty. And I like the glass container your flowers are in. I'm totally in love with your elegance...everything you do looks so classic and lovely. I am so dang country that everything we have IS country..and I so enjoy looking at your beauty. Love all your stemware, too. Just love it all !! Hi Bill, lovely. I love the china and your fabulous runner. This was a really good idea...enjoyed seeing it! Such lovely dishes! Where on earth do you store all of these? Thanks for sharing. What a great idea for a tablescape. Your words: "I figured it wouldn't hurt to offer less. Prices often depends on how much the dealers have invested in the pieces, whether the rent is due, if they're overstocked, etc. It definitely pays to be polite, and it's never a good idea to offer an insultingly low amount." never rang truer! This is lovely! The china is beautiful, and I love the Rock Sharpe stems. What a great deal. So, what's for breakfast? You always do a great job, rain or shine!! I enjoyed all the trivia info too! Beautiful post. I haven't seen a placemat for two...that is unique! I love your dishes and stemware. You never disappoint! Wonderful!!! The china is gorgeous...love the color!!! You have thought of everything...perfect in every detail!!! That is so pretty! You could do a fancy dinner with wine, or cereal and juice and it would look lovely any which way! The china is gorgeous! As is the stemware. I love the crocheted runner used as a placemat. I really enjoyed your sharing the history of the pieces. Thanks! I love your china! You are so talented with the table designs and your pieces are wonderful! Great bar-scape! Would love to have any meal there. Great repurposing of those frosted horn Pilsner glasses as vases! Bill, your glassware is stunning! I so love pretty glasses. I often set a "tablescape" on my counter for my husband and I. It is perfect. Wonderful job! FANCY breakfast! LOVE the plates! Wow, I would love to breakfast on that beautiful china. It is such a pretty color and I love the pattern. The stems were also very nice. Great table---barscape. 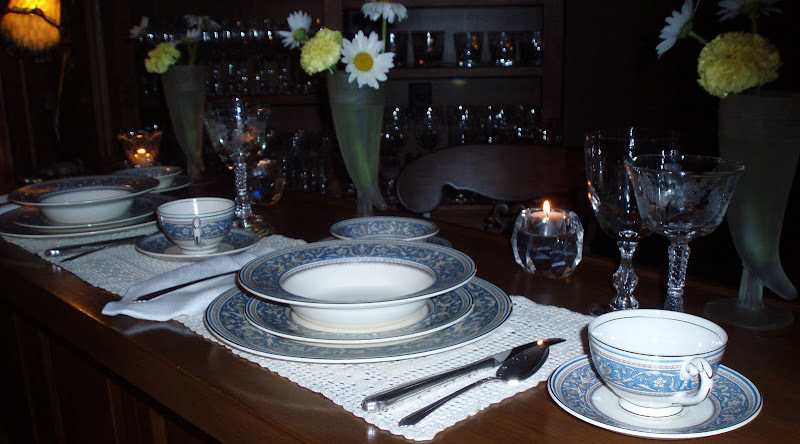 Hope you join us Saturday for the final CIJ tablescape. I love your breakfast bar for two. I'll have some grits and poached eggs, please! I am always so amazed at the beautiful pieces you find for such great prices. I definitely need to get out and go to some estate sales. Everything is just breath-taking. You have a special touch! What a lovely breakfast bar for two! Very nice as always and I love all the history, too! What a lovely breakfast bar you have set. Love the dish pattern and colors. Very pretty - you did it again.You have some very pretty stemware. I am not very good at negotiating prices myself. 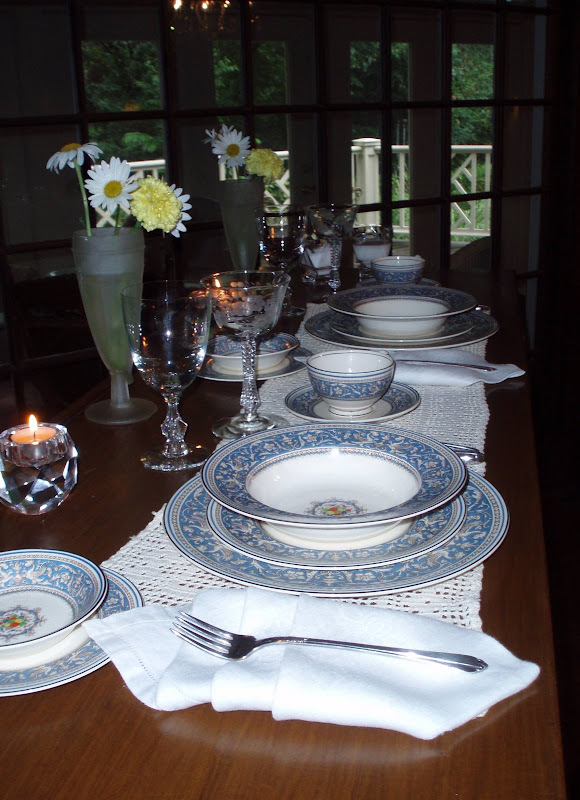 Bill.. i love this tablescape... and I've got some great Florentine Depression Glass sherberts that would look really nice with them.. if you'd like to send me a few plates.. LOL... yes, I know you'd rather I send you the sherberts! I LOVE those frosted pilsners. So unique. Very pretty table (bar) setting. And I share your appreciation for glassware collecting - I recently picked up what I thought was a set of 3 crystal glasses at an estate sale for $1. I was on cloud 9. Went home immediately to unpacked the little box and there were 3 more glasses on the bottom layer. Giddy, I tell you!! Hi Bill.. I love the Rock Sharpe Stems & the Medici china.. oh so elegant! Can't wait to get a full showing of your glassware collection someday. Oh! Bill! That thrifty tablescpae is absolutley exqisite! I love love love the dishes! Such a gorgeous table. Your guest will feel like VIP's at your table! Well done! Thank you for linking up to Thrifty Thursday this week! Be sure and drop by to see what the other thrifty participants are showing off. Some really great finds! I'm a first time visitor to your lovely blog, as I saw FiFi's painted rendition of one of your tablescapes on her blog today and followed her link. I live in a small house in NYC with little storage room for dishes and accessories, so I live vicariously though everyone's Thursday tablescapes. Your settings are outstanding! Thanks! I love the plates! they are beautiful! Stunning! All fabulous finds! My favorites are the runner, the sugar and creamer, and the vases! And marigolds and daisies are much nicer breakfast flowers than roses anyway. I'm on a fast, but I always make exceptions for coffee! I have just discovered your blog, came via Fifi's blog. 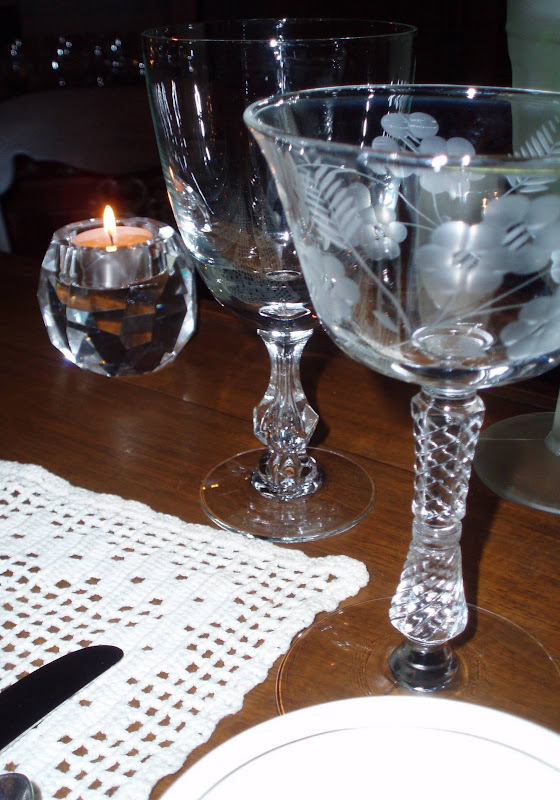 Love all your beautiful table settings and the crystal glasses. Always so lovely to have nice China, cutlery and glasses for dinner. I look forward to coming back again. I agree that one can set up a tablescape in any creative setting. I think that your china is lovely crazing and all! I also agree about the history and use making it feel loved! Very elegant.. I think a Queen wouldn't mind eating Corn Flakes and fruit out of those beautiful bowls!! Hugs!! What a lovely idea to breakfast at the bar. Your dishes are devine and I love your stemware. I enjoyed the little background you provided on some of the patterns too. I did 3 posts today but none of them were tablescapes but I still had to come by and see what you had done. A tablescape is any where you decide to be. I have seen a lovely one on a blanket in a field. Whether you are having eggs Bennie or a frozen waffle your table setting is perfect. Your breakfast bar is very inviting, and the stemware is exquisite! You know more about glassware than I will ever know! Thanks for stopping by and visiting me today too! You are in the drawing several times for my giveaway!! Come back again! This is an amazing coincidence! I just looked this pattern up today after searching for turquoise china. I am on a quest! Bill, this is another lovely tablescape. You have done a wonderful job of combining elements to make a welcoming and elegant look. 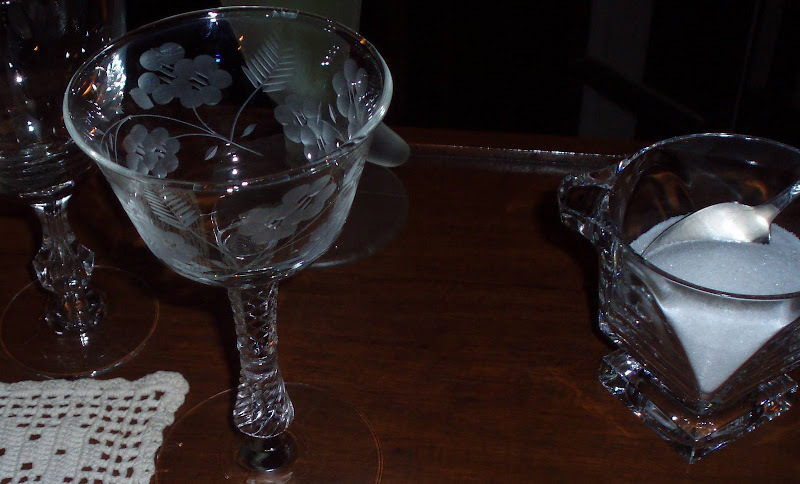 My mother has a complete service of Heisey Orchid Etched, and she has some gorgeous serving pieces in the pattern. Bill, your tablescapes never disappoint! Hi, Mr. Bill..just wanted to stop back by and say that I say Fifi's painting of your beautiful tablescape. Just love it. Love the china -- but especially love those etched glasses. And the Fifi painting of your tablescape -- way cool! Even without 'my' flamingoes, it's stunning. And the long handled silver--love that! My mom had Fostoria and it was gorgeous stuff. I'd love to find some for her again, but boy, is that pricey stuff. And the stems on all the glassware is just gorgeous! I LOVE your collection of glassware. Thank you, Bill, for stopping by my blog and for your kind comments. And thank you for boosting my pathetic 'followers' number! I've been reading back here a little and am enjoying your posts. Amazing how you pull everything together all the time. I love your breakfast bar table scape. Your dishes and glassware are beautiful. Those vases are beautiful too.......I love a good find !! OK, so I was just imagining you setting a table at our house everyday. You make everything beautiful and a special event.